Web services, the light and simple way! Where is the Source, Luke? You can obtain the latest source of code of Jayrock from the Mercurial repository hosted at Google Code. Needless to say, you will need a Mercurial client for your platform to access the repository. If you don't have a Mercurial client handy and just wish to browse the source code, you can do so online. The third argument, jayrock, is the directory name where the local working copy will be downloaded so this can be another name if you like. If you want a snapshot of the latest files without bothering to go through the source repository then you can simply download them from the Files section of the project. Jayrock was originally maintained in a Subversion repository that is still available in case you want to consult its earlier history using Subversion clients. Note: For quicker setup instructions, see the section Setting Up Jayrock. Once you have checked out a working copy of the source from the respository, you can compile Jayrock in one of two ways. You can either open the included Microsoft Visual Studio solution files and use the IDE to compile the projects or you can use the included NAnt build script to compile from the command-line. Jayrock: The complete solution that includes and builds the JSON-RPC, JSON and some experimental sandbox (playground) bits. Jayrock.Tests: Solution that contains a test-view of the project, with references and sources for unit tests. The Visual Studio solutions target .NET Framework 4.0 only. To compile for other versions, use the NAnt as described in the previous section. Jayrock is provided as open source and free software (as per Open Source Definition and under LGPL) for two principal reasons. First, an open source community provides a way for individuals and companies to collaborate on projects that none could achieve on their own. Second, the open source model has the technical advantage of turning users into potential co-developers. With source code readily available, users can help debug quickly and promote rapid code enhancements. In short, you are encouraged and invited to contribute! Please contact Atif Aziz (principal developer and project leader) if you are interested in contributing. For more information, see Jayrock on Google Code. The above things require time and energy and if you can donate it then there is nothing better for Jayrock. Honestly! On the other hand, there is only this to consider. Has Jayrock helped you in a project at your daytime job? Well, a lot of companies happily profit from open source projects in terms of time and money (especially if time is money), so talk to your manager or development lead about making a small donation. If you or your company wish to be listed as a donor, then send along any or all of the following information to be directly listed here: your name, company you work for and a link to your and/or company's home page (would also be nice to know the country). Thanks! Jayrock is an open source project and so naturally relies on to build, leverage and enjoy peer support from a community of users with a shared interest in the project. Assessing if Jayrock is right the right solution for you? Having trouble using some aspect of it? Want to simply provide feedback or ideas for further development? Then Jayrock Google Group is the place to go. Open the Microsoft Visual Studio 2008 solution file called Jayrock Web under src and build the entire solution to compile all contained projects. There is also a NAnt build script but this builds all other projects except the web project. If you compile from the command-line, the only additional step required at the moment is to manually copy the resulting Jayrock.dll and Jayrock.Json.dll assemblies from one of the bin sub-directories (depending on the target platform and desired configuration) to the bin directory under www. Select the Demo.ashx in the www Web Site project and then choose View in Browser from the file's context menu. IMPORTANT! This quick start tutorial and its code illustrations are based on [revision 790][r790] of Jayrock. If you are using an older build then some of this tutorial may not make sense or work. In that case, use the tutorial supplied with the version you have instead if you cannot upgrade right away. tutorial, you may skip adding the following sections to your web.config. The above configuration lines enable various features on top of your service. These features are accessed by using the feature's name in the query string to your handler's URL, as in ?feature (very similar to how you request the WSDL document for an ASP.NET Web Service). First and foremost, there is the rpc feature. It is responsible for actually making the JSON-RPC invocation on your service upon receiving a request over HTTP POST. Without this feature, your service is JSON-RPC ready but won't be callable by anyone. The getrpc feature is similar except it makes the services methods callable over HTTP GET. To see if everything is working correctly, select the greetings method from the drop-down list and click the button labeled Test. If all goes well, you should see the string "Welcome to Jayrock!" returned in the response box of the page. 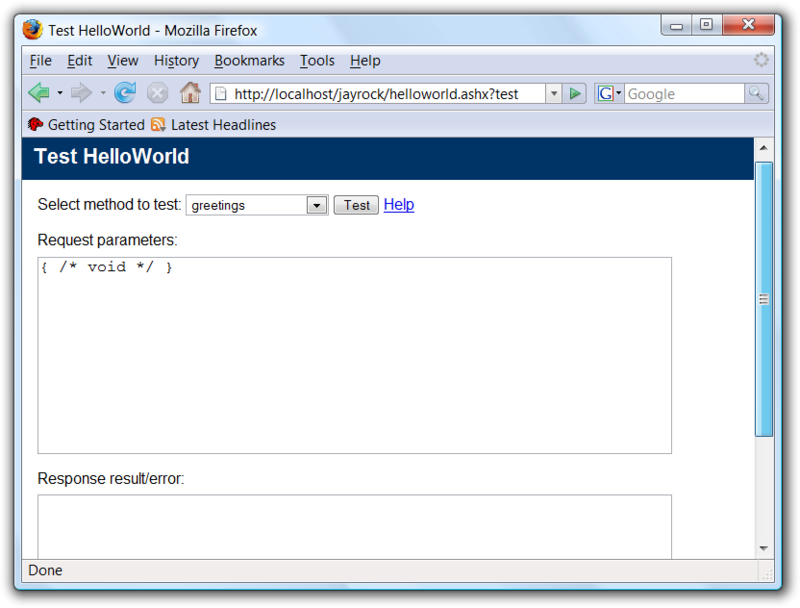 Back in the browser, type the URL http://localhost/jayrock/hello.html in the address bar. As soon as the page loads, you should see two message boxes show up one after the other and which display the string "Welcome to Jayrock!" returned from our JSON-RPC service method greetings. The first message box will be from the synchronous execution whereas the second from the asynchronous one. Let's take the same HelloWorld service developed in the previous section and try to call it from a WSH script. Put the following markup into a Windows Script Host Script file called hello.wsf. Open a Window Command Prompt, change to the directory where you saved hello.wsf and simply type hello to execute it. If that does not work, you may have to type the full command-line, as in cscript hello.wsf or wscript hello.wsf. When the script runs, it should display the greeting message from the service. Just as in the case of the web page, the WSH script references the JSON and service proxy script files as external sources to be imported at run-time. In fact, since the scripts will be fetched from the web server, the WSH script will pick up changes automatically by downloading the latest copy. Notice also that the references to the external scripts use absolute URLs since the WSH script will in reality live at an independent location from the web server. That's it! We're done. Hope you enjoyed this quick tour. 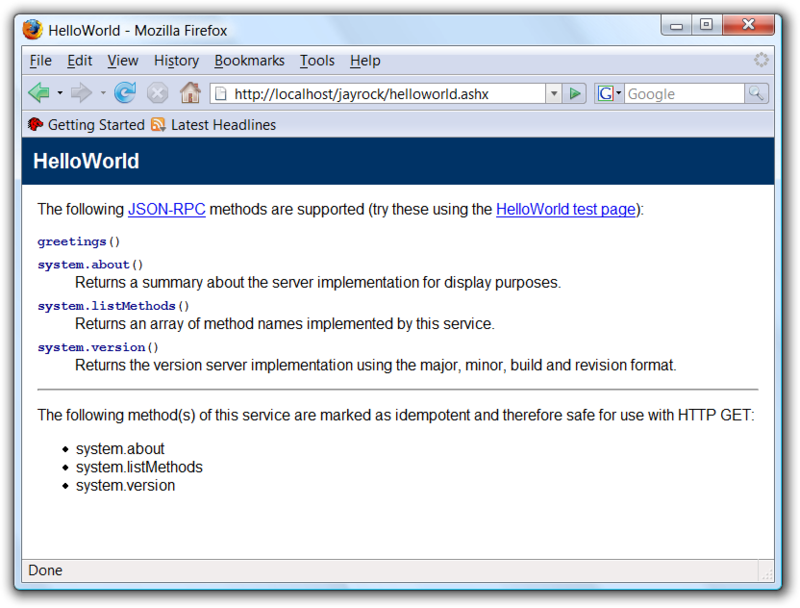 You can find a number of JSON-RPC methods demonstrating various features in the supplied demo service. See http://localhost/jayrock/demo.ashx on your machine for a working copy of the demo. Jayrock Project Presentation: This presentation contains illustrations that briefly cover the architecture of Jayrock's JSON and JSON-RPC implementations. Beware, however, that some bits may be obsolete now since the presentation is based on a very early build. If you don't see your questions or concerns addressed below, then try over at the Jayrock discussion group. What can I do with Jayrock? You can use just the Jayrock's JSON infrastructure for manipulating JSON data and text without all the JSON-RPC fuss. Just use the stand-alone Jayrock.Json assembly. So wait, is Jayrock yet another Ajax framework? Which versions of the Microsoft .NET Framework are supported? Jayrock is compiled and delivered for Microsoft .NET Framework 1.x, 2.0 and 4.0. Just toss the corresponding assemblies at your application and you are good to go. JSON-RPC is a light-weight remote procedure call protocol that relies on JSON for the wire format. All it does is provide a simple way to express a call frame as a JSON Object and the result or an error resulting from the invocation as another JSON Object. For details, see the JSON-RPC specification.